This entry was posted on June 21, 2011 at 12:06 pm and is filed under Afghanistan, Barack Obama, Conservative Issues, Economy, fascism, first Jeremiah Wright term, Hillary Clinton, Media, Nancy Pelosi, Politics, socialism, terrorism, United Nations, United States. You can follow any responses to this entry through the RSS 2.0 feed. You can skip to the end and leave a response. Pinging is currently not allowed. So the law abiding citizens of Tampa, who were riding the bus somewhere, are guinea pigs for DHS??? IF we win in 2012 it is going to take years to undo this tyrannical crap Obama and his minions have foisted upon America. And this kind of tyranny has NEVER existed save for liberals. 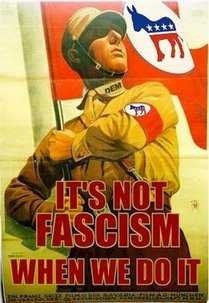 Liberals lecture conservatives and call us names like “fascist” that apply ONLY to them. The thing is that they want only power – raw government power, the power to control all our lives and shape us the way THEY want us to live. They can say one thing and do the opposite because all they stand for is raw naked government power. And “morality” or “ethics” is merely a means to an end (raw naked government power) to these people. Obama talks about caring for the poor. But we find that he NEVER gave to the poor until he started running for president. Everything he said was just a cynical load of crap. Nancy Pelosi talks about caring for the poor. But when she used all the insider information to increase her wealth by 62% while the rest of us got poorer, did she give that to the poor? No. She put it in her pocket while she kept demonizing Republicans who DO give to charity. Same with the Clintons; same with John Kerry, same with John Edwards. And the programs these hypocrites constantly preach do NOTHING to help the poor. They just create more poverty, which is to say they just create more people to keep voting Democrat for the next handout. And all the while these liberals are doing everything they can to increase the scope and power of government while they take more and more and more of our rights away. BECAUSE THEY ARE FASCISTS AND THAT’S WHAT FASCISTS DO.